This home is in the highly desired South Pomerado neighborhood in Scripps Ranch. This Stonefield hom has lovely stained glass double entry doors and soaring ceilings. A curving staircase captures you as you enter the living room , dining room area. Light and bright throughout. Kitchen has granite counters, stainless appliances, recessed lighting. French doors open to patio off dining room for entertaining. Family room w fireplace, dual French doors. Master has dual French doors, deck. Walk to pool!, Enter thought custom dual stained glass doors off front patio. 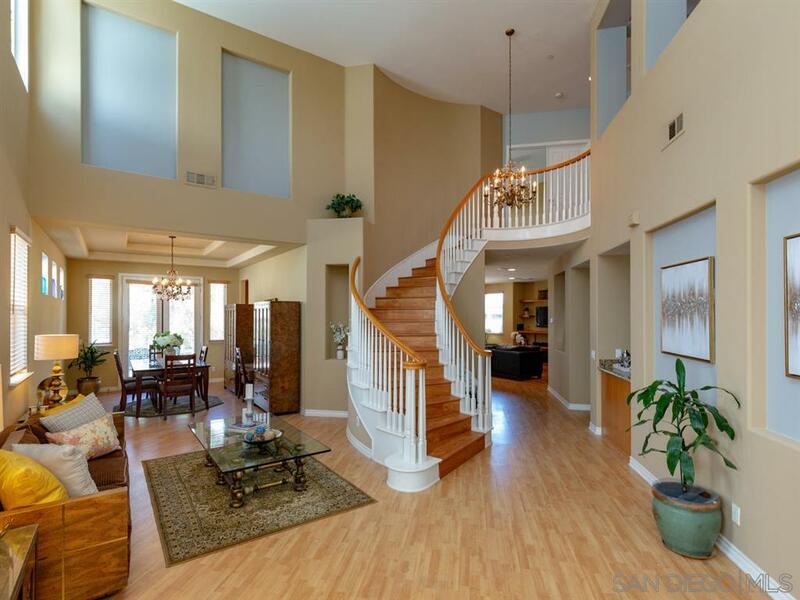 You'll find the living room with soaring ceilings with a dramatic curved staircase. This home has lots of natural light and recessing lighting throughout. Newly painted and new flooring upstairs. Formal dining area has sound and dual French doors to lovely stone patio with shade structure and lighting for your dining pleasure. There is a large flat backyard and stairs down to the area below with fully grown shade trees. Enter the kitchen and you'll find granite countertops, recessed lighting, ceiling fans, and breakfast nook with fan, and island. The appliances are stainless and there are dual overs with lots of cabinet space. Open into the family room area with build in shelves, fireplace and dual French doors to back yard area where you'll enjoy a sound system. The family room also has surround sound. There is a bedroom and full bath downstairs with decorative glass tile and full laundry room. Upstairs is the master suite with deck for beautiful sunsets, breezes. Ceiling fans keep you cool, there are also dual air conditioning units and the home offers high energy efficient appliances and dual pane windows. There is a retreat off the master for office, workout etc. Master bath has a large soaking tub, enclosed glass shower, dual mirrors and custom glass backsplash. Your dreams come true as you enter the large walk-in closet. Home is fully wired for communications, ethernet, wireless. Bedrooms upstairs are large and have fans. Attic has additional energy efficiency. Large office opens to look down on living and dining area. 3 car garage with epoxy floors and plenty of storage racks above and room for more storage.